Summer is for us both a good time to travel and a good time to catch up. We’re doing both this year and the result of some of the “catching up” is in today’s newsletter. 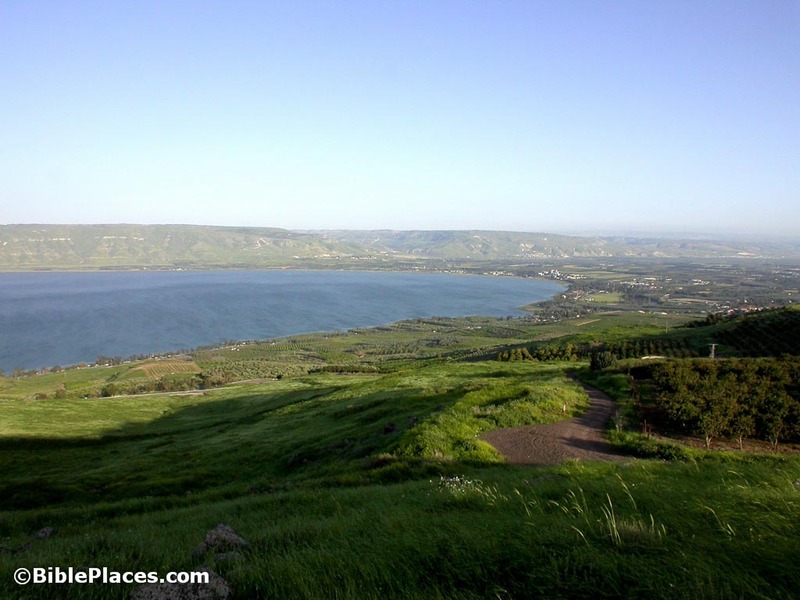 We have some fun map comparisons, some free Pictorial Library updates, and a collection of Sea of Galilee photos. We’re also offering a 20% off sale on any orders of our photo collections through June 30. If you think that this newsletter would be helpful to someone you know, feel free to pass it on. Thanks! Just how big is Israel? I’ve heard it is about the same size as New Jersey. That’s helpful, unless you or your audience doesn’t know how big New Jersey is. How big is Jerusalem? About 10 acres (4 hectares), in the time of David. But how big is that? Wouldn’t it be nice if we could compare biblical cities and regions with familiar places? MAPfrappe offers just such a service, and it is free. Reader Eric Lundquist recommended it to us and we have found it quite useful. But we thought it would be more valuable if we had some sample maps ready for quick use. A.D. and Katerine Riddle offered to come up with some creative comparisons that you could easily view and download. 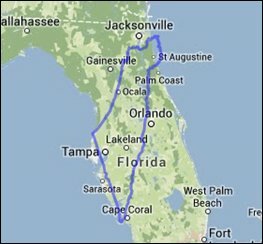 Here’s how it works: Click any of the links below to see an outline of that city or region superimposed on Google Maps. Then drag and zoom the lower map to your city, state, or anywhere you like. Hazor – the largest tell in Israel. You can make all of your own for free at MAPfrappe. Or use our pre-made outlines using the links above. If you come up with any you think are particularly interesting, we’d like to know. Following the extensive revision and expansion of the Pictorial Library of Bible Lands in 2012, we decided we would work to provide new photos as free updates to purchasers. Bearing in mind what James says about “boasting about tomorrow,” we have been reluctant to make any promises in this regard. Nevertheless, our intention is to regularly create expanded and new photo sets for our users. The procedure is intended to be simple: each volume or collection includes a link to a webpage where the updates are listed. 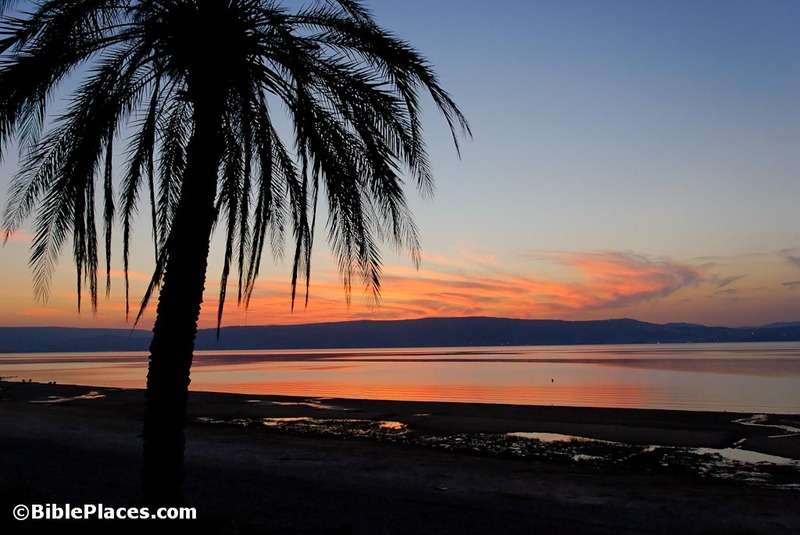 This week we added our first two: owners of Galilee and the North may download an expanded “Nazareth” PowerPoint (and 18 new photos); those who have purchased Judah and the Dead Sea may download an expanded “Joppa–Tel Aviv” set (with 44 new photos). Questions about this? Check here for answers. 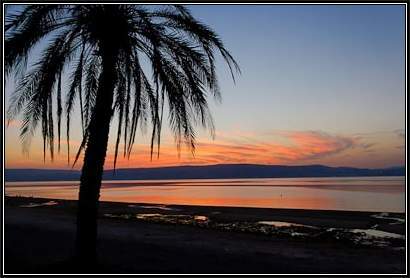 Why is the Galilee region a favorite region of Israel to so many? I think it has to do with its combination of beautiful landscapes and rich history. This is moreso for the Christian visitor who has heard the Gospel stories all of their lives. Almost all of Matthew, Mark, and Luke prior to Jesus’ arrival in Jerusalem record his life and ministry in the Galilee. To the traveler’s great delight, the area is largely undeveloped today. 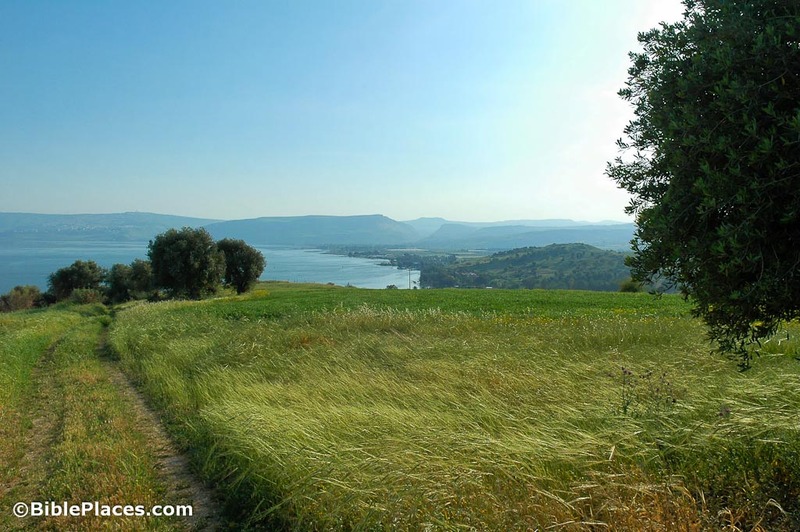 When coming from Jerusalem where urban sprawl has conquered nearly everything not covered by a church, Galilee is a refreshing place to visualize the Savior healing, teaching, and loving his own. The photos below show scenes similar to what Jesus may have witnessed in the first century. All of the photos below, plus some additional ones, are available in a free PowerPoint presentation. A limited version is also available in pdf format. Readers are welcome to use these images for personal study and teaching. Commercial use requires separate permission. For more high-quality, high-resolution photographs and illustrations of biblical sites, purchase the Pictorial Library of Bible Lands or the Historic Views of the Holy Land collections. Click photograph for higher-resolution version. Download the PowerPoint presentation for all of the photos. 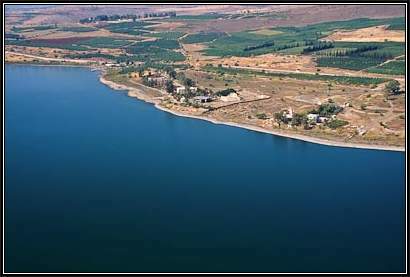 The southern portion of the Sea of Galilee is an area that Jesus surely would have seen much of, but the Gospels do not record much of Jesus’ ministry here. Two miracles were apparently performed on the opposite shore in what was then known as the Decapolis: the demons cast into the herd of pigs (Mark 5:1-20) and the feeding of the 4,000 (Matt 15:29-39). This photo shows the land in April after plentiful winter rains. 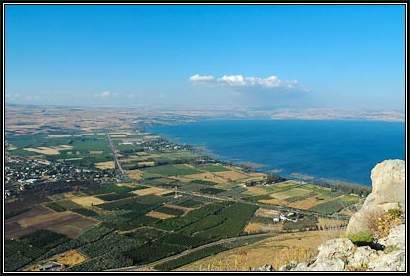 In contrast with the first photo, this view of the northwestern side of the Sea of Galilee shows the primary area of Jesus’ ministry. 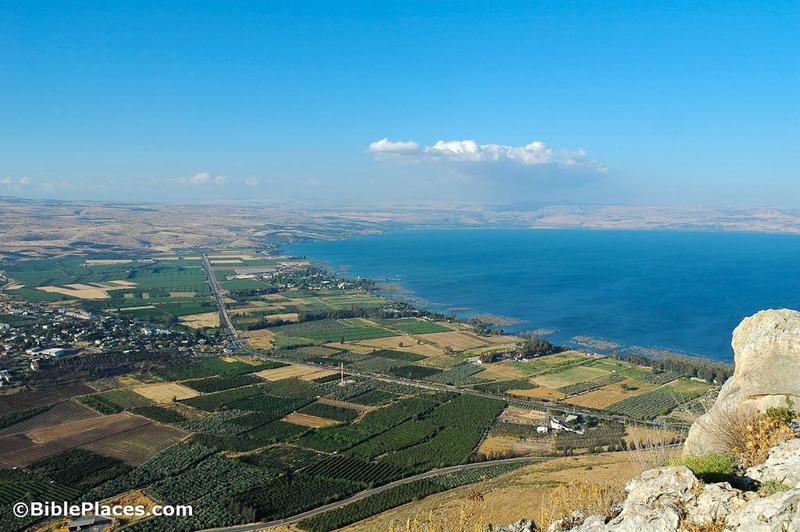 Nearly every event, teaching, and miracle recorded in the Gospels in connection with the lake occurred within view of Mount Arbel. A few examples: the calling of the disciples, the feeding of the 5,000, the walking on water, and every event recorded in Capernaum. In addition, the traditional area of the Sermon on the Mount is located here. 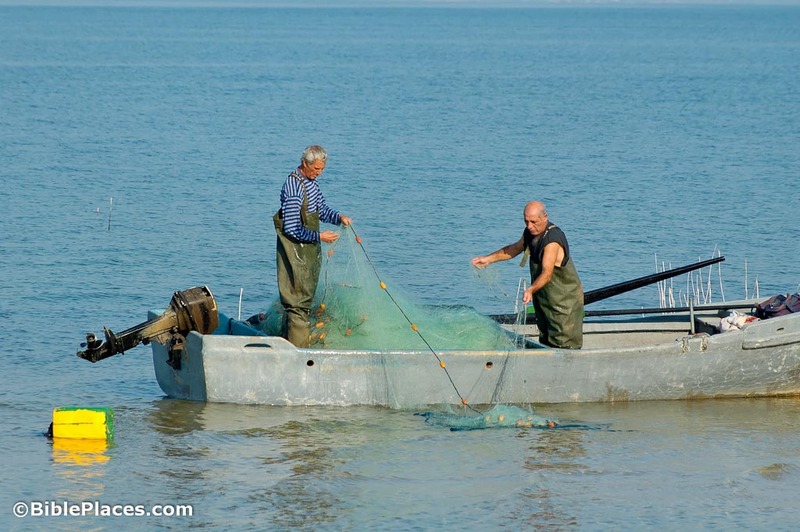 Unlike in Jesus’ day, there are few fishermen on the Sea of Galilee today. One of the reasons is that the supply of fish is greatly depleted. The fish farms in the valleys to the north and south meet much of the modern demand. But a few fishermen still practice the ancient craft, though their attire and locomotion has evolved. 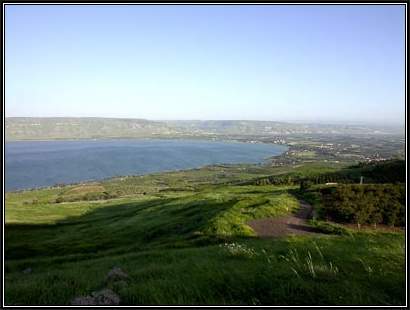 The Sermon on the Mount may be the most famous message in history (Matt 5-7), and the traditional location has a beautiful view of the Sea of Galilee. I usually advocate the site is possibly authentic for two reasons: (1) it is close to Capernaum and Heptapegon (Tabgha), both important in Jesus’ ministry; (2) the size of the hill is suitable for a large crowd. What was the sermon all about? Jesus explained what was necessary in order to enter his kingdom. Those who are poor in spirit, meek, pure in heart, and have a righteousness greater than that of the teachers of the law will live with Jesus in his coming kingdom. If I could visit only one place in Galilee, I’d choose Capernaum. 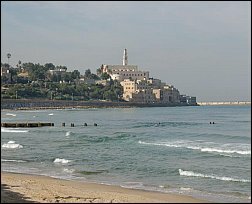 This seaside village was Jesus’ home for three years of his earthly ministry and here he performed many miracles and taught many lessons. 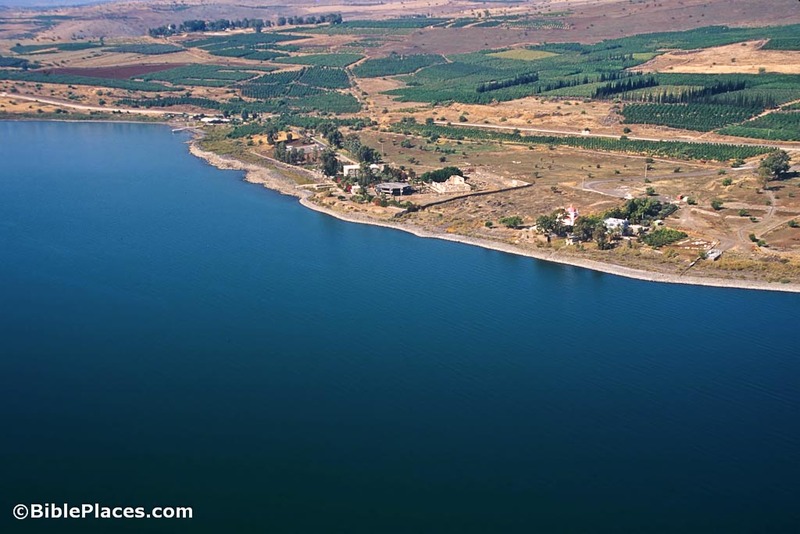 Where exactly did Jesus live in Capernaum? We don’t know if Jesus lived with Peter’s extended family (note the mention of Peter’s mother-in-law, which indicates that Peter was married; Mark 1:30). Or perhaps Jesus’ own family relocated with him from Nazareth—Mary and his four brothers and two (or more?) sisters. We know that at least on one occasion they were all in town (Mark 3:31). Ultimately we simply don’t know where Jesus lived. Perhaps that is a good thing, lest someone erect another church over the spot. 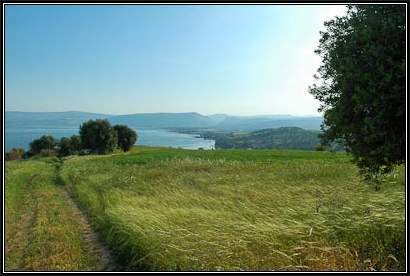 Jesus was standing along these shores when the Pharisees and Sadducees asked him for a sign. His response: “When evening comes, you say, ‘It will be fair weather, for the sky is red,’ and in the morning, ‘Today it will be stormy, for the sky is red and overcast.’ You know how to interpret the appearance of the sky, but you cannot interpret the signs of the times” (Matt 16:2-3). These astute weathermen were staring at the Messiah and did not recognize him. Another sign would not solve their problem. There are people who would love to read this newsletter but they don’t know about it. You can tell them about it or just forward the entire newsletter to them. The BiblePlaces Newsletter is cost-free and spam-free. Email addresses will never be used for any purpose other than this newsletter. If you have questions about the subscription process, see this page. All contents © 2014 Todd Bolen. Text and photographs may be used for personal and educational use with attribution. Commercial use requires written permission.